I was walking down the street in Warrenton, Virginia, it was such a fine sight to see,,,Well, not so much for a linden street tree. 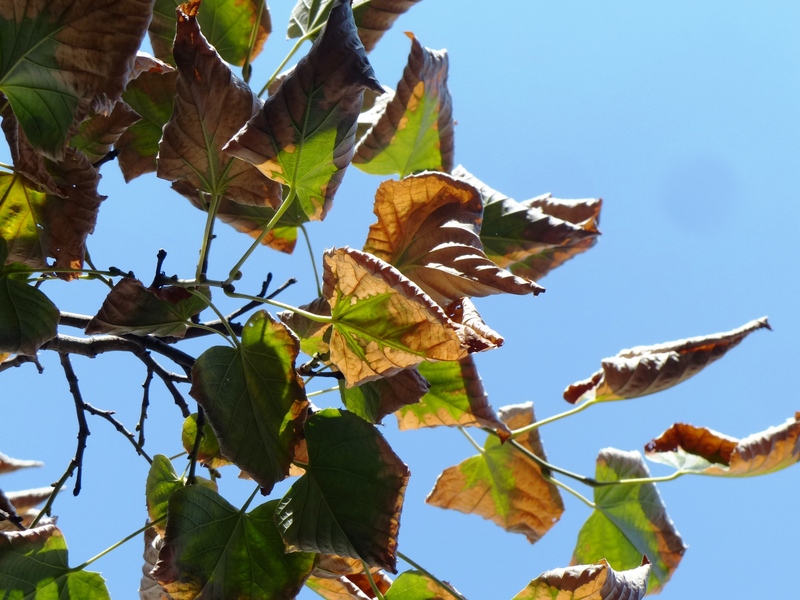 It was in fact a fine blue-sky day, but backlit against that sky, the leaves of this linden displayed serious leaf scorch along the outer portions of what should have been deep green leaves. The tree itself was not thriving, annual growth was poor, and the leaves looked as parched as the 95 degree southern day. The culprit? The trunk had a completely flat trunk where it entered the soil. This is suggestive of a stem-girdling root that is restricting a good portion of the vascular system inside the stem, enough to result in the observed scorch and poor growth. Prognosis: negative.